Cornerstone Commercial Supply, a name most of my regular readers will remember from articles in the past year is calling it quits on eBay. 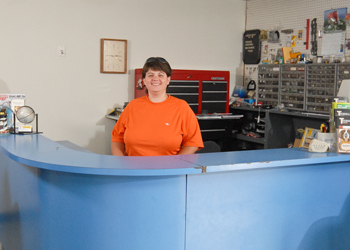 Cornerstone is an established small business with over 30 years of quality service dealing with the public. They offer a unique niche product selection which would seemingly be ideal for eBay. Commercial carpet cleaning products, tools, and machines both new and used. Just as a small bit of background, let it be known that the owners of Cornerstone Commercial Supply are not rich people. They are the father and daughter team of Richard and Connie Carpenter, they both work every day to survive in this difficult economic environment. Richard Carpenter has been in the Commercial Carpet Cleaning business for over 30 years and as a distributor for over 12 in his present location. He and his daughter Connie are honest, hard working dedicated people who give the customer a fair shake even when it is not necessary. I consulted with Cornerstone Commercial Supply to bring them onto eBay as a client of iBusinessLogic in 2007, with the very best of intentions, now I feel as though I owe them an apology for what it is I have done. It seemed to me to be a perfect match back in the end of 2007. We researched similar product sales on eBay with advanced eBay research tools. This research revealed a steady and growing market for the professional carpet cleaning products, with competition already established and selling on eBay. 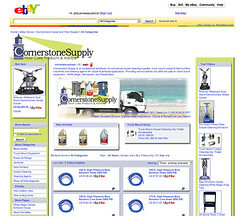 We had a solid plan and in our view, no other carpet cleaning supplier had approached the niche as we would, with a dedicated and well designed eBay store, a full product line, and very competitive pricing, we felt we had a good chance of growing a nice secondary business on eBay for Cornerstone Commercial Supply. The store design was completed and a very enthusiastic new seller on eBay was born in January of 2008. 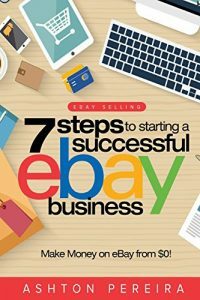 Unfortunately, since that first happy day and after the first sale on eBay on January 07, 2008, just about every roadblock to success has been tossed at Cornerstone by eBay, PayPal and to some extent - eBay's buyers. It has been a very rough year for this small business on the Internet. The trouble began with eBay almost immediately. The system eBay has put in place for new sellers is designed to prevent fraud, understandably so, but as a result it also prevents new small business owners from taking advantage of the eBay marketplace until certain milestones are met. One policy in particular served to slow Cornerstone's growth and stunted their success on eBay - the Feedback requirements. eBay requires new sellers to have certain levels of feedback to utilize all of the selling options available on eBay. This single requirement prevented my client from establishing themselves as an eBay store which offers a broad range of products to serve the needs of the buying public. Simply because it was not cost effective to place hundreds of items on the site as 7 day auctions only. Fixed price was needed, and feedback is required to sell fixed price. It might be good to know why this policy is still in place, is it more difficult to scam an auction buyer than a fixed price buyer if you are dubious seller? I don't think so. As you may recall, eBay was pushing fixed price very heavily last year and some say the search results were skewed in the favor of fixed price listings over auction format. We have no evidence of this but I can tell you that Cornerstones listings did not receive the same amount of results as other sellers in the same niche. As a result, it became imperative to get feedback. When sales were made, the buyers did not bother to leave feedback for this seller, as they have no requirement or incentive to do so on eBay since the feedback system was changed to a one way street in 2008. This fact alone places the entire feedback requirements for new sellers into question in my opinion. When buyers have no incentive or reason to leave feedback for sellers, and sellers can only leave positive feedback for buyers, the system is not on a level playing field. eBay has the capability of verifying the credit and banking accounts of business owners, so why should feedback be part of the equation at this point? This has not affected established sellers as much as it has new sellers on eBay. eBay needs to remember that as established sellers leave, new sellers will be required to fill the void. When new sellers encounter this kind of friction, will they endure the pain or simple find other options? Cornerstone could not respond by reducing pricing to a level below cost because of manufactures requirements to keep pricing at a retail level. It was a inhospitable start for a brick and mortar business on eBay. (Some will say we could have gotten feedback any number of ways, including low cost recipe purchases and by having friends "buy" imaginary listings, while I did not advise my client to do these things, I did inform him of the possible options, it was a matter of survival. Richard did not want to game the system in this way and continued paying fees to offer products on eBay as auction only listings). Eventually the feedback issue was met by Cornerstone but not without a certain amount of confusion by these small business owners as to what the purpose really is for having these restrictions in place. The first article I wrote which involved Cornerstone and a less than favorable experience with eBay came long after these initial bumps in the road, personally I was still very much involved with offering eBay up as a great place for small businesses to join the Internet sales bandwagon. It hurt me to write the truth in the following article. Live Help - Communication at eBay - Cornerstone of the Buyer Experience was an article detailing how poorly eBay handled a problem which ended up closing Cornerstone's eBay store down for several weeks without explanation. Followed by: this article: COMMUNICATION should be open - Not restricted! eBay - Please Read This! The result of all of this bad communication and lack of customer service from eBay towards this small business seller was a pervasive lack of trust for the site or its management from my client. Connie Carpenter especially felt that eBay was going out of its way to limit her business and waste her time. Richard, her father took a more pragmatic view and since they had really done nothing at all wrong he viewed the whole episode as a bump in the road. In the end, eBay did absolutely nothing to help resolve this situation, multiple phone calls only resulted in multiple versions of bad information. We were even told Cornerstone's account had been hacked by Vladuz in Romania. (not at all true but this information came from eBay). After the issue above was resolved Connie was more skeptical of the entire situation with eBay. She continued to maintain the eBay store with carpet cleaning agents, parts, tools and machines but I could tell she had an uneasy feeling about the entire eBay selling program. After all they had just been shut down for weeks and she had spent dozens of hours on the phone and online with live help trying to resolve the situation. When this resulted in nothing but stonewalling, bad information, and passing the buck to Trust and Safety (who would never speak with her) Connie was just at the end of her rope with eBay. Richard had not dealt with the phone calls and resulting frustration himself. He works on Truck Mount Carpet cleaning machines and with his customers all day every day. He liked the exposure the eBay store was giving him and the additional calls he received from other states looking for information about his products. 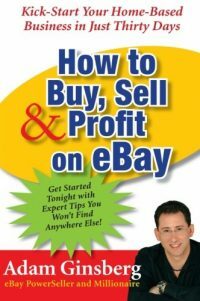 Richard really wanted eBay to work and he trusted that all of the issues thus far had been anomalies, that in the end all would work out and his business would succeed on eBay as others had. Richard had not dealt with eBay directly as Connie had and thus his perspective was different. So the odyssey continued with months of sporadic sales, lots of watchers, some direct telephone calls but no huge increase in sales after the feedback levels were met and fixed price 30 day listings became available. Products were listed in auction format, stores format and as fixed price listings. Shipping was fast and reliable, exclusively with UPS and customer service was top notch. Everything eBay wants in a seller was right there with Cornerstone. PayPal? yes, PayPal... hard to imagine? Not for some sellers, especially not those who have experienced the PayPal credit card charge back scams perpetrated by buyers each and every day on eBay. This is a scam that cannot be guarded against by sellers as they must ship when PayPal accepts payment and lets make that point clear, PAYPAL accepts the payment. Cornerstone listed a $1200 carpet cleaning power wand extractor and sold it directly on eBay in September 2008. The sale went flawlessly, the buyer paid immedately via PayPal and PayPal confirmed the payment. At this point the seller, Cornerstone Commercial Supply has no way to verify the payment and no reason to do so. PayPal said it was good, so they shipped. The item was sent via UPS with tracking and insurance. Tracking was confirmed and delivery made. The item was shipped to the buyers verified address and was accepted. The buyer filed a PayPal dispute. PayPal almost immediately accepted the dispute as valid from the buyer and removed the funds from the sellers PayPal account. This is without a single email from the buyer or any explaination as to why the transaction was disputed at all. PayPal launched thier investigation. Connie at Cornerstone sent PayPal every piece of information she had. She faxed shipping information and the eBay information she called and she followed up. Then she tried to contact the customer who would not accept a single call or respond to any emails. Buyer Disputes Charges - Not the shipment - not the product - just the charge. PayPal conducts 90 day long "Investigation"
90 days of suspense culminates in PayPal returning a verdict in favor of the buyer. Keep in mind, the buyer never once said that they did not receive the product or the shipment so UPS insurance will not cover this. The buyer also did not state that they did not make the purchase on eBay. What the buyer said is that they did not "authorize" the charge on their credit card. In effect, the buyer claims they did not authorize the charge but still received the product has not returned the product, has not been directed to return the product by PayPal and will not answer any calls or emails from the seller. The buyer has stolen the merchandise with PayPal's blessings and help. PayPal will not elaborate about what their "investigation" revealed but they have no problem in insisting that the seller is responsible. Cornerstone is dumbfounded by this turn of events. They paid fees to PayPal to process and verify authorization on this payment, they followed the rules and they shipped a quality product. Cornerstone paid for the item, the shipping, insurance, and fees to both eBay and PayPal and they get what in return? The privilege of paying not once for a stolen item but twice because they are without the goods and the payment. Richard and Connie Carpenter no longer feel that they can trust the business environment on eBay. They both tried very hard to understand the various problems that have been presented over the last year by eBay and now PayPal but this last 90 day torture test was the end for them. They can not trust PayPal to accept payments and verify them and if you do not accept PayPal payments you can not do business on eBay. The eBay system has failed this small business. I am in complete agreement with Richard and Connie's decision to walk away from eBay. While I know that eBay works well for many sellers it also has become less hospitable for new small business sellers like Cornerstone Commercial Supply. eBay is a very complicated and diverse marketplace with numerous minefields and seller traps to avoid. Small business sellers like Connie and Richard, who sell high dollar items need more protection from PayPal and less restrictive rules from eBay. If eBay insists PayPal be the only form of payment, they must make that payment golden. When sellers like Cornerstone can not trust PayPal to make good when PayPal makes the mistake of not verifying the credit card of a buyer, a process the seller has no access to or responsibility for, then they can not trust PayPal and thus can not sell on eBay. iBusinessLogic has already started a new website for Cornerstone Commercial Supply. We have not developed the site out completely but now that the client will have more time to devote to the stand alone website we will be working on this aspect of the business more. One plan would include moving the eBay inventory to Bonanzle and integrating that inventory into the Cornerstone website explained further here: Bonanzle Shopping Cart Solution. Today it is even more important for small businesses to establish themselves online with their own web site presence. Simply placing all of your faith and trust into one huge outside venue like eBay or Amazon is not a smart business decision. If your business model works online, it should be established with its own URL and website. Control of your brand, your product, your sales and your customers then lies in your hands, not with someone else. I hope to update my readers with the transition of Cornerstone to Bonanzle (if we follow that plan). We already know through previous experience that Bonanzle is a very friendly, Search Engine optimized and easy site to manage. As a shopping cart solution it could not be easier for a small business to utilize. Payment options include Google Checkout, PayPal, Checks, Money Transfer, or almost any form of payment available. When these attributes are combined with the advantages of having a stand alone business website with the freedom and control necessary to present your business as you want your customers to see it, we feel the solution fits the need of small businesses. I am personally saddened by the turn of events between Cornerstone and eBay. It was largely my advice that sent Cornerstone on this path yet they do not blame me for these events or the result. As such I cherish the trust this client has placed in me to help them find the best way forward and the am inspired by the clients understanding that I could never have predicted all of the various changes and oddities that eBay has thrown at them in the last year. We will bring Cornerstone the success they deserve online - it just wont be on eBay. Heartbreaking story. My son had almost the same situation except he’s not a business, he’s a college student trying to make enough money for his semester books. He sold his golf clubs so he could attend college last semester and the guy filed a dispute with pay pal & they yanked the money back out of my son’s account. Nothing wrong with the clubs or the delivery, just a dispute about the charge on the buyer’s card. No amount of correspondence with the buyer or pay pal helped. Poor kid ended up with no golf clubs, no books, and a big headache. Of course Mom came to the rescue because I couldn’t bear the frustration. Don’t worry, kid’s back in school. Bad bad pay pal. Good article on a sad situation. I have thought like many others that Pay Pal securely checks to accounts and works to settle trouble fairly, but we can see this is not always the case. Makes a seller think not just twice, but many times about accepting Paypal as payment. That said….I would love to WELCOME Cornerstone to the Bonanzle Family of sellers. I feel they will do well on Bonanzle and with Their new site online by iBusinessLogic, there will be much smoother days ahead for them. Thanks Scott, for bringing them over to Bonanzle.com! And take THAT eBay! You Lost yet another one! Thank you for bringing this example of the debacle that is currently occuring for untold numbers of small businesses on eBay & PayPal. It says a lot for the integrity of your clients that they can see the real culprit is the corporate behemoth at eBay and not you. I wish all of you the greatest of success and hope to see you on Bonanzle. We moved our business off eBay in November and are happily working to bring our numbers up with our own site & Bonanzle. It is sad what ebay has done to the marketplace. It has caused many people not to trust them or paypal, Thousands of small sellers as well as powersellers, have left ebay just for the same reasons as Richard and Connie have faced with them. At Bonanzle, they would be welcome indeed ! It would be great to have them selling their products on Bonanzle. Many of the fine and reputable business people here at the Bonz have had serrious problems with eBay policies and practices, including myself, and being a part of this growth-oriented community, that we lovingly call The Bonz, I have discovered a True and Honorable home to sit my business up at here. Our on-going discussion concerning your artical and the Carpenter’s dilemma is one of a knowing pain felt for Mr Carpenter and his daughter. No matter where you place your new online home, our support and blessings go with you good folks. I went through a similar situation and I pulled the resources of the BBB in San Jose, the IC3, the USPS, and the Arkansas State Attorney. With those 4 resources, my paperwork, etc. I received my entire refund from Paypal, closed my account, closed my eBay account and have never looked back. The Fraudulent Buyer thought they’d get by… not by me. Never give up but whatever you do, move on. What a horrible experience for CornerStone! They and Scott did everything right, and they got burned. A primary reason we left eBay was because of the constant fear that the rug could be pulled out from beneath us without warning. One of the joys of being at Bonanzle is the peace that comes from knowing our business is safe, and that ultimately we are in control of all aspects our business. Terrible story! I think it’s near impossible for a new business to make it on Ebay (unless they’re a diamond). With veteran sellers leaving in droves, Ebay might just be in for stormy weather. Serves them right. And if the Diamond’s decide it’s not worth the effort, where will that leave them? The ill will John Donahoe and his henchman created in 2008 may never be healed. I hope Bonanzle and other venues make it, and make it Big!!! The door is open and the light is always on at home: Bonanzle. We eagerly await your arrival! If you need any help be sure to get a hold of any one of us. You are going to love it here! Let me know when you start!! I am saddened by the Carpenters experience, but not at all surprised. It is a situation we are hearing about more and more. What makes it even more shocking is that they had the enormous advantage of having a seasoned seller as their adviser and mentor. The way PayPal and eBay are currently set up amount to a license to steal, and the crooks are taking every advantage of the opportunity. A search of eBay may well show Cornerstone’s item re-listed for sale by the thief. I would advise Connie to contact her state’s Attorney General, the California AG, file a complaint with the FTC, the Postal Inspectors department (it is mail fraud because it was an online sale) and the San Jose BBB. Also notify the National Fraud Information Center. All the links to online complaint forms etc. can be found here. Finally, I hope the decision will be made to come to Bonanzle. Mark and Bill the founders are, as you know Scott, responsive and accessible, and provide real live American person support. The site is set up to be easy to use and with Google Base feeds and the option to use Google Checkout the Cornerstone supply products will receive worldwide exposure. The company will save a fortune on monthly store fees, listing fees and final value fees. Google Checkout verifies buyer cards prior to notifying the seller of sales and costs 1/3 less than PayPal. Additionally GC sweeps funds to the sellers account automatically and quickly. Funny how GC can deposit to your account within 48 hours while transferring money from PayPal can take 5 business days or longer. Combining Bonanzle with your custom site will give your clients control of their online business again. Why not sell on eBay and only accept credit cards like most other websites, including Amazon if you are having issues with PayPal? This seems like a weak excuse – drop PayPal what is the big deal here? I have a question for the thread: do Amazon sellers ever suffer from these scam PayPal chargebacks? If you have, could you tell us how it was resolved there? As for Bonanzle, I’ve heard great things about them and plan to open a store there soon. But however good they are now, it’s too soon to heap up the praise for how they handle fraud, because they are too new to have much track record. As they get bigger, they too will attract the Chinese scammers and the chargeback buyers. Have they said anywhere how they plan to handle fraud on the site? Excellent insight and truly a travesty for Cornerstone. However, as one door closes, another one opens. As a small business WAHM Power Seller store owner who quickly rose to the top, I too am closing my store, have established my own website for my Vintage Collectibles, and am exploring the option of opening a Bonanzle store. In my first post of the New Year on my blog, I explained my reasoning. If a buyer did that to me, I’d take them to court! In today’s society with so many scams, I will never sell anything over $100 online. We have already had chinese scammers and they were dealt with promptly. There are procedures in place for seller verification when certain red flags are seen. Sellers have the option to accept whatever payment method they choose. There is no way Bonanzle can or should be held responsible for chargeback buyers, think about it. Unlike eBay Bonanzle does not dictate how you run your business. In my experience this does not happen as often with Google Checkout, my preferred processor. Just wanted to reassure Cornerstone Commercial Supply that they made a wise decision in leaving Ebay. Ebay is not what it once was. Even us well established Powersellers on Ebay have turned and walked away because of the new rules for sellers and problems with Paypals Trust and Security issues. What you described about Ebay has happend to alot of us me included. It’s tough for all of us on Ebay. I’ve walked away and found a new home on Bonanzale and we’d love to see you there as well. What ever it is you decide to do I wish you much success in your new online ventures. having had Paypal steal money from me twice in this way,I sadly was not surprised by any of the turn of events. Here is a ray of hope in the international area. I wrote letters, I wrote the scammers town police station,I wrote the Mayor of her town, and the Taiwan ambassador , I wrote my local police, and most importantly I sent copies of these letters to the scammer. Within 7 days I received a certified (heres the funny part, signature required) letter from the scammer with a plea to call off the dogs and a money order for the full amount. I sent copies of all to paypal they never acknowledged or responded. I then sent emails to all the last sellers the scammer purchased from and they sent her nice letters too. I personally have never had a problem with paypal but after reading many horror stories such as this one I am tempted to pull the plug with paypal. So, if Bonanzle takes Paypal payments… what will stop this from happening to Cornerstone again? Anonie Mouse, This is my question also…although I have heard people say that PayPal does not behave as badly with their non-eBay clients as they do with their eBay clients. This would make sense as non-eBay clients are not so much of a captive audience and would be more likely to leave if given such horrible customer service, while the eBay gods have declared that on eBay, the customer is always right. Over the years of doing business on Ebay, I only accepted payment by money order or in the case of repeat buyers, I accepted checks . . . When Ebay forced me to list PayPal as the preferred payment method, I posted notice on my sales that I do not accept Payment by PayPal and that started a round of petty harrassment by Ebay that lasted several months . . .
Ebay would knock off my listings just before the auction expired and it was obvious that they had singled me out for “special treatment” because of my obstinate desire to have secure payment . . . Even after I stopped posting that notice, they continued to knock my listings off for various unfounded reasons, claiming avoidance of Ebay fees, keyword spamming and other nonsense that was totally unfounded . . . I began a campaign of “reporting” listings that were truly in violation of those policies and monitored those listings . . I discovered that those dealers who used PayPal exclusively or made mention that they prefer payment via PayPal are exempt from the rules . . . They are still there and still violating Ebay policies . . . None of their listings was ever removed . . . Indeed, having some experience in retail, wholesale and manufacturing, I identified several sellers who were selling obvious counterfeits of branded merchandise and reported them to Ebay . . . They are still scamming the buyers to this day and I’m sure that no investigation was ever done . . The average person has no means of determining the real from the fake designer items and those sellers are still on Ebay, ripping people off with the assent of Ebay/PayPal who only cares about their share of the loot . . . .
Now, I’ve limited my auction listings to low-dollar items and very few listings . . . As a small seller, my few hundred dollars in fees that they lost will not put a dent in Ebay/PayPal but, I do envision that as they lose sellers and others reduce their use of Ebay as an outlet, they might ‘see the light’ and reverse their position . . . I am looking for other sites but haven’t found any with the exposure that I desire . . . . When I do, Ebay will be history for me, too . . . . I assume they were not covered under “expanded seller protection”? If anyone from this point on – rather since the start of nNovember- experiences a similar situation (PayPal clears to ship, you have confirmation and if the purchase over 250.00 signed delivery) and someone comes back with an unauthorized claim you are covered under the new seller protection. Do not allow these crooks to steal your money- and I am referring to PayPal. Tell them with absolute certainty behind you that the transaction is covered by seller protection and whatever should occur between PayPal- the buyer- and the CC is not your problem you followed the policy and they need to put your money back NOW! Do not get off the phone until they do. Also, it would probably be wise to start taking a screen shot of the shipping clearance screen for all transactions. This scenario is especially scary for consignment sellers! Are PayPal charge backs common on Bonanzle too? Does Google checkout make buyers return the purchased goods prior to refunding the money? I do not understand why the paypal seller protection did not cover the ebay sellers loss. Please explain as some of us think that is what will save us in this situation. Myself included. We have no explanation from PayPal as to why this transaction was not covered. And no explanation as to why the transaction was reversed or the investigation failed to see that the item was delivered to the PayPal confirmed address. They have not been very forthright at all. I have not personally dealt with them but Connie Carpenter has and she says they will not return calls or reply to emails. No real communication about why, what where or how they could come to this conclusion. The item was shipped and received and the buyer has not returned it. Yet the payment has been reversed because the buyer says he did not authorize the charge. Thats fine, but it was PayPal’s job to verify the payment and the payer, not the seller. Very poor communication from PayPal and really no reasoning behind the decision. Sorry, wish I could resolve it for my client, much less my readers. Also…I just looked at Bonanzle for first time. I see they also accept paypal. What is safer about accepting paypal at bonanzle vs. ebay. Same risks? Or is it just the ability to advertise that you also or only accept checks and mo’s as well. To me the advantage of Bonanzle in this situation is the factor of open communications. Sure you can get burned there as in anywhere, but at least you have access to the buyers contact info and unrestricted emailing capabilities before, during and after the sale. Also, I think you get a different type of buyer at eBay than at other venues. Very disturbing Article on how “Greed-Bay” and “PayUs-NotU” has in essence, ripped of another Honest Business Person. As you know, I’m right down the Street from you and Richard’s Store, and I’ve had the pleasure of doing business with him while I was in the Carpet Cleaning business as a Chem-Dry Franchisee; and my brother still does business with him as an Independent Carpet Cleaner and he’s attended some of the Class / Certification Courses that Richard offers in his Store. Bottom line, Richard’s a very nice and helpful person and it’s a damn shame eBay / PayPal and a dead-beat scam artist buyer… took any of Cornerstones Hard Earned Money! Personally, I would NOT swallow a $1,200 Loss, I can’t afford it in by business… and if Richard can’t either… then he could spend a few extra hours pursuing his recovery of Funds from PayPal and the Deadbeat buyer. But Scott, I am a bit surprised by your Article statement. It’s NOT surprising . . . is it? 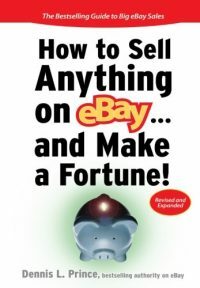 2008 was an Anti-Seller Campaign on eBay the entire Year!… with Ton’s of oddities and changes that could, would and did harm… many many Sellers. Anyway, PayPals Seller Protection WILL protect Cornerstone on this Transaction. PayPal failed to require Buyer to Return Merchandise, which is PayPals responsibility before they Void or Overturn an UnAuthorized Credit Card Transaction. If Buyer does NOT return Merchandise, PayPal will have to Refund Sellers Account . . . and it’s then PayPals responsibility to work out Payment with Credit Card Company, who will then contact Deadbeat Buyer to either Return or ReCharge / Authorize the $1200 for the item in Scam Artist buyers possession. Failing that, though I’ve not had to go further down this Route with PayPal… Filing a Police Report and contacting State Attorney of Bidders location… you’d go after him Criminally! Bottom Line… Richard needs to pursue that Protection clause. Just a thought. Cornerstone might want to file a small claims case. I used to work at a courthouse and Judge Judy’s people would contact a clerk at the courthouse asking for interesting cases. This goes on all over the country and there are other TV court shows as well. Would love to see this get publicity. reason and explanation! For 6 years I felt I was always walking on raw eggs. just because they found 1 wrong word in the listing – i.e. IVORY! AND didn’t refund the listing fees. PayPal??? OMG I don’t trust them anymore at all. one to a buyer in Russia ! Instant payment and even more than asked for !!! After 3 weeks sold one to the SAME buyer – Instant payment! After that I sold a 3rd one and had a feeling this is fishy and ALARMED PayPal that this looks VERY suspicious. I ASKED them 3 !!! times if they approve of this payment. But I stopped the shipping. 2 weeks later all 3 payments were taken out of my account without any notice. I provided all papers, insurances, shipping confirmations, PayPal wouldn’t even answer. I’m a happy camper on BONANZLE and welcome everybody over there! Need help ? (everybody does at first) just contact me. I’m on PC almost 24/7!! Welcome CORNERSTONE… it’s easy here and lots of fun too! A traumatic story very well written up. I have to confess however, a little surprise that you are now recommending your client go to yet another sole channel strategy (outside of the website you are building for them). Whilst Bonanzle may be a good fit for them due to the SEO tools available for the site, which fit nicely alongside the SEO tools you’ll need for their website – but remember to use different Google accounts for each or their listings will not get indexed due to “duplication” – there are additional channels open to them too. In particular I am thinking of eBid.net where they can pay a 1-time $50 registration and sell without fees for life, and receive 5 online store presences with their own individual names and product categorisations for store directories. Plus the in-store categories and sub-categories that sellers can set up give the same flexibility as eBay stores, whereas Bonanzle currently only has top-level client set store categories. eBid’s five store system allows the seller to retain one or two for selling personal items and oddments, whilst developing distinct and branded “personalities” for their business stores. eBid has also been around 10 years, has a very large membership and 18 sites worldwide that work from a unified inventory base (no cross-border visibility restrictions) and sellers can select which individual countries they will or will not ship to. Additionally GoogleCheckout and MoneyBookers (plus NoChex, PayPal, cheques, moneyorders etc). In fact sellers can offer any payment system they want to – including jelly beans if they feel so inclined (I prefer Jaffa Cakes myself). What I’m trying to say is that after the mono-channel experience that CornerStone have had with eBay, and the mono-processor experience of PayPal, they should be thinking about having parallel options open rather than going along the same path again.